The Darleys Hollywood host hotel is the BEVERLY WILSHIRE, a FOUR SEASONS HOTEL. ALTERNATIVE HOTEL ACCOMMODATIONS - RESERVE BY MARCH 16! We have a very limited block of rooms at the COURTYARD MARRIOTT CENTURY CITY as a budget friendly alternative to the Beverly Wilshire on Darley weekend (1 mile from the Beverly Wilshire). The rate is $219/night plus taxes. Parking is an additional $22/night. Rooms are available from Thursday, April 5 through Sunday, April 8th. To book a room at the COURTYARD MARRIOTT CENTURY CITY, call 800-750-0953 and refer to the “DARLEY AWARDS GROUP” to access the rate. This block expires on March 16th, so you must make a reservation prior to this date. Sign in to the Arabian Racing Cup News List for updates about this world class event. 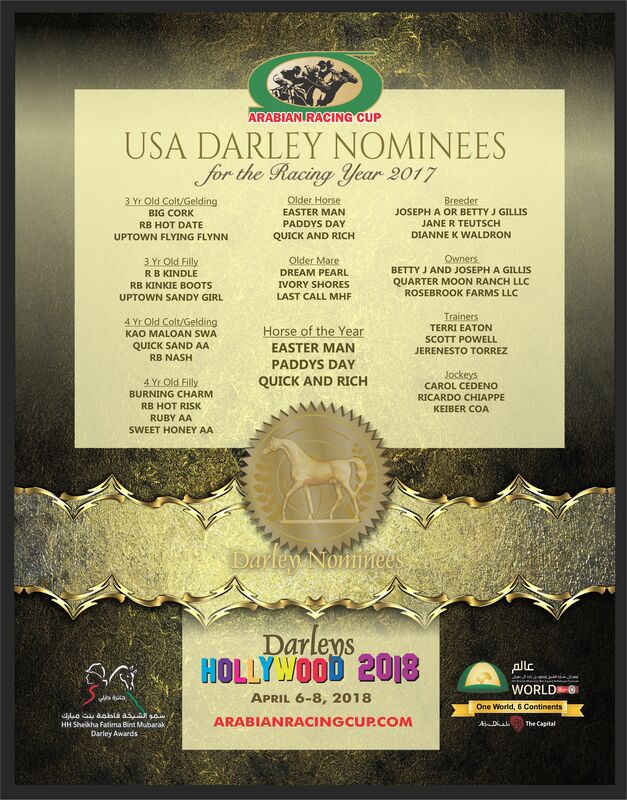 Founded in 1983 by Dr. Sam Harrison, the Arabian Racing Cup's Darley Awards ceremony is the showcase of U.S. Arabian racing. In 2012, the HH Sheikh Mansoor Bin Zayed Al Nahyan Global Arabian Flat Racing Festival and the Cup joined together to promote this prestigious event. 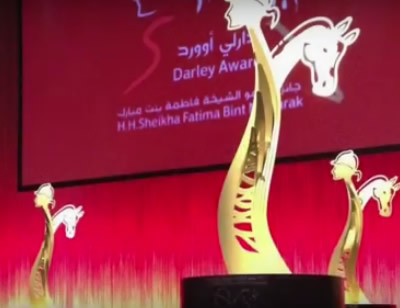 The Darleys are headlined by the HH Sheikha Fatima Bint Mubarak Darley Awards recognizing international women in Arabian Horse Racing. 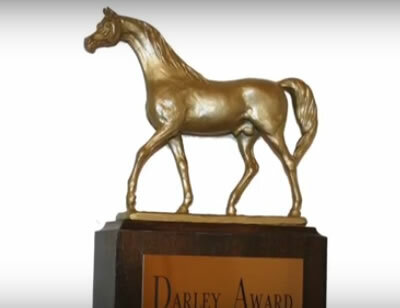 The Darley Awards is under the direction of Lara Sawaya, Executive Director of the Festival, and organized by Arabian Racing Cup, The HH Sheikh Mansoor Bin Zayed Al Nahyan Global Arabian Horse Flat Racing Festival is sustained by the Abu Dhabi Tourism and Culture Authority and coordinated by Abu Dhabi Sports Council with National Feed and Flour Production and Marketing CO. LLC as associate sponsors in cooperation with Emirates Racing Authority, IFAHR, Emirates Arabian Horse Society, Ministry of Foreign Affairs, General Authority of Youth and Sports Welfare with The National Archives as the official partner and Emirates airline as the official carriers and sponsored by Bloom, Petromal, Rise General Trading Co. LLC, Hayatna,Abu Dhabi National Exhibition Centre (ADNEC), Al Awani General Enterprises, Kabale, Al Wathba Centre, the UAE's General Women's Union, The Supreme Council for Motherhood and Childhood, the HH Sheikha Fatima Bint Mubarak Ladies Sports Academy, Abu Dhabi International Hunting and Equestrian Exhibition 2016, Dr. Nader Saab Switzerland, Al Wathba Centre, Abu Dhabi Equestrian Club, Eastern Mangroves Suites-Abu Dhabi by Jannah, Yas Channel, Omeir Travels, Racing Post, Paris Turf and Laboratories Fadia Karam Cosmetics.